With the pronouncement that President Trump is pulling the United States out of the Iran nuclear agreement, many have been left wondering what exactly is left of the legacy of Barack Obama. For many, the Iran deal signifies former President Obama’s signature achievement during his two terms in office. Sure, Obamacare ranks right up there, but then, that too has been torn apart with the repeal of the individual mandate. Obama himself decried the decision to abandon the nuclear agreement calling it “misguided” and a “serious mistake,” neither of which is accurate and sounds more like the mutterings of a man whose legacy has been torn to pieces. Maybe, just maybe he should have considered going through Congress for his Iran deal. Or his executive orders on illegal immigration. It’s almost as if governing via a pen and phone is a bad idea. “Trump makes history withdrawing the U.S. from the onesided ‘Iran Deal’ all but destroying Obama’s Legacy,” writes political cartoonist A.F. Branco. It is, after all, exactly what Trump ran on. America had buyers remorse with President Obama. That’s why, as likable he seemed as an individual, his policies led to historic losses for his party at every level of office between 2010 and 2016. It’s why we now have a President Trump, who has been tasked with erasing his liberal predecessors every move. Then again, it wasn’t much of a legacy to begin with. It never really had coherence in the first place. 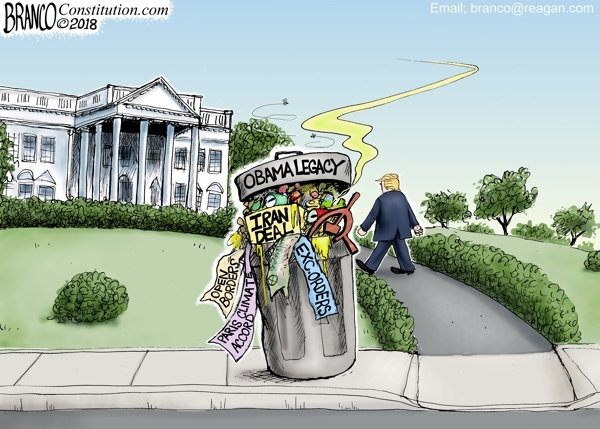 That’s why it’s in a trash heap outside the White House lawn. Has President Trump trashed Obama’s legacy? Tell us what you think below! Previous post Former Hillary Adviser Posts Vile Rant Mocking Donald Trump Jr.